I've got a classic for you today, Sally Hansen's Complete Salon Manicure in Commander in Chic. Believe it or not this is the first time I've tried this line of nail polish but since Walgreens currently has these on clearance for $2.29 a pop, I had to grab them while I could. I picked up a variety of colors and of course I had to choose one of the line's most popular colors, Commander in Chic, a great taupey neutral that has a hint of purple to it. This color can be worn for any occasion, work or play. I don't normally use colors like this but it really complimented my skin tone well, and being a neutral color, I imagine it would look great on anyone. I found the formula for CSM to be pretty good, with nearly one coat to become opaque. I'm a habitual two coater so these pictures are all two coats, topped with one coat of Poshe which probably wasn't necessary as Commander in Chic had a shine on its own. The formula was on the slightly thick side for my taste, which limited how well it self leveled but I'm willing to forgive that since it's a one coat polish. These are all taken indoors under natural lighting. Overall CSM is a line that I would be happy to use again. You may want to grab these while you can because SH's facebook page says that these are getting phased out and they are releasing the line with a new formulation this December. Besides Walgreens, there have been sightings of these on sale at Big Lots, Dollar Tree, and Ross. Bonus pictures!! I loved how neutral Commander in Chic is and how well it can work as a base for a variety of glitters. 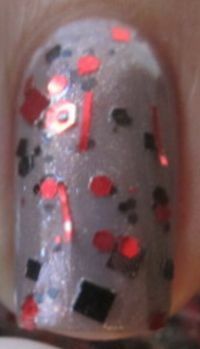 I layered over a glitter that I had a hard time trying to find an undie for, and I think it works great - this is one coat of Lynnderella's Lucky Numbers, a fun red and black multi-sized glitter in clear base with holographic shimmer.